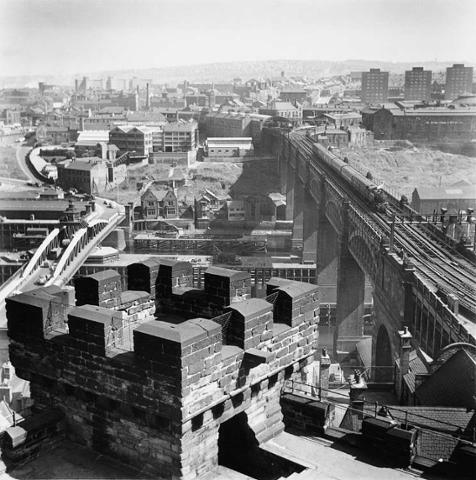 I couldn’t resist sharing this wonderful photograph, taken in 1957 by Jimmy Forsyth from the top of the Castle Keep in Newcastle upon Tyne, looking South across the Tyne towards the Midlands. The two historic bridges in view are the Swing Bridge (left; completed in 1876) and the High Level Bridge (right; completed in 1849). The more famous Tyne Bridge is just out of shot to the left of the frame. The picture was posted by the Twitter account of Tyne & Wear Archives a few days ago.